With just 3 weeks until our Crafty Christmas Market, we are excited to introduce you to the first four of our artists and makers. Our market will open its doors on Friday, December 1st from 6pm - 9pm and will be open Saturday and Sunday, December 2nd& 3rd, from 11am - 6pm! But for now, let's have a look at some beautiful present ideas and Christmas treats. Kirsty studied Painting at Camberwell College of Art, graduating in 2013. Her art practice has always involved creating kaleidoscopic and fragmented fantasy worlds. This has been expressed in a range of media; painting, collage, photography, film and laterally drawing. She has a keen interest in community art and collaborating with other artists where shared ideas in an interdisciplinary approach can be explored. Kirsty’s designs are drawn from her conscious and subconscious thoughts. They flow from a meditative state, focusing and clarifying her mind whilst blurring the lines between fantasy and reality. They are inspired by observing and responding to the world around her; shapes, colours, patterns, emotions, and sounds for example. With this specific style of working, she doesn’t have a pre-conceived idea of what the overall image will look like, allowing the process to unravel and for the piece to find its own conclusion. This mindful approach feeds her art practice. Kirsty’s most recent and ongoing project, ‘Yellow Brick Road’ has been questioning identity and which path to take in a vibrant city like London, where the range of choice can feel overwhelming and exciting at the same time. At our Crafty Christmas Market, Kirsty will be selling limited edition giclee prints with and without frames (30x40cm £40, 40x50cm £60), handmade screen printed cotton cushions (£60), wrapping paper (pack of 3 sheets of recycled paper with Christmas design, £5), gift tags (pack of 5 with matching Christmas design as wrapping paper, £2), limited edition screen printed silk scarfs (£160), Origami artwork in frames (£25), and Origami Christmas decorations (£4). Aisling Keavey is a London and Dublin-based photographic artist, curator and writer. She is an internationally exhibited photographic artist who has developed a distinctive aesthetic through extensive practice-led research and photographic printmaking. At our Crafty Christmas Market she will be offering her 6x4 mounted prints for £2 each. Cecilia Washburn Designs is based in Brixton, South London. Cecilia is a lover of wildlife and all things colourful and unexpected. Cecilia spends her time intricately studying wildlife to create colourful, bold yet painterly and intricate illustrations and repeat patterns. Cecilia comes from a Fashion Textile background, her designs are textile influenced, trend-driven and as an active artist she is constantly creating new designs and refreshing her product range. Cecilia Washburn Design products are all made on recycled paper and are designed with high attention to detail and so that the illustrations will be treasured, perhaps framed and have longevity to them, her cards are more than just a card. At our Crafty Christmas Market, Cecilia will be selling A5 & Square greetings cards (£3 each or 3 for £8), A6 notebooks (£3 each or pack of 3 for £8), A5 notebooks plain & dotted paper (£6 each or pack of 3 for £15), as well as stationary gift sets: Gift box containing 5 cards, 1 A6 notebook, 1 A5 notebook (£20), A4 limited edition Giclee prints of my illustrations (in mountboard £30, framed £45), and A3 limited edition Giclee prints of my illustrations (in mountboard £50, framed £65). Lauren is the founder of Wild Goose Chase. They are a colourful kidswear brand, hand knitting super cozy hats for little ones. Lauren started knitting about a year ago and fell in love with loom knitting very quickly. Since then she has been spending all my time setting up Wild Goose Chase and has just opened up her Etsy Shop. Lauren has a strong belief that kids should have free choice in the colours they wear and not have to stick to gender stereotypes. You will never find a 'girls' or 'boys' section in her store allowing children to have the freedom to pick a hat based on what colour they like, not what they feel they should have. 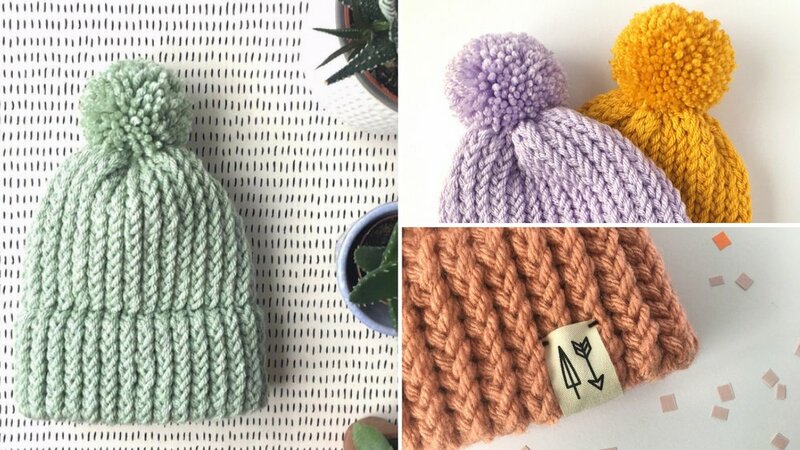 All beanies are handmade on circular looms in their South East London studio. At our Crafty Christmas Market, Lauren will be selling her hats priced at £30 each. There will also be a small bargain collection of one off hats for £15. All artists and makes will be offering exclusive deals to those that RSVP to our event. Register now for exclusive offers at our Crafty Christmas Market! Check back next week when we introduce the next four artists and makers !